Amy all smiles at work! I was excited when Amy messaged me to participate in an interview because she has a very popular Youtube channel for her DCP that I recently began watching! An example of her videos and her entire experience is at the bottom of the page, but first let's hear about her experience working in a candy store! 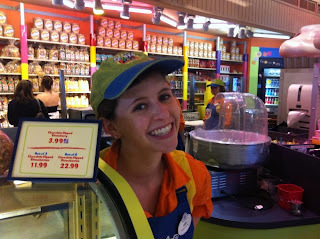 I worked in Merchandise at Goofy's Candy Company in Downtown Disney! I'd take the F bus from Chatham to Typhoon Lagoon and then to Downtown Disney. I usually arrived early because I always took an early bus to avoid being late due to the unreliable busses. If I arrived early I'd usually hang out in cast services, get a coffee and read a book until it was time to walk over to Goofy's. I'd head over and clock in. There were two different kinds of shifts I could work at Goofy's: a kitchen shift or a floor shift. My schedule indicated which kind of shift I had on which days. We had to know in advance because the costume varies slightly depending on the shift. (We had to wear an apron, hair net and hat for a kitchen shift). If I was working a kitchen shift I'd spend almost my entire shift in the onstage kitchen! Possible positions I could have been assigned were "Caseline" (asking guests what treats they'd like from the case and wrapping them for them), "Production" or "Production Assist" (looking at what treats we were short on and then making them and stocking them), "Dip Station" or "Dip Assist" (making the custom orders guests fill out at the dip station), "Caramel Apples" (making, you guessed it, caramel apples), or "Cotton Candy / Candy Apples" (making cotton candy and candy apples). If I had a floor shift, then I'd spend my shift out on the floor. For a floor shift I could be assigned any of the following positions: "Register" (there were 5 registers in Goofy's and depending on the specific register I was placed at, I could be ringing up guests, bagging purchases, greeting guests, pouring icees, getting coffee, or wrapping up treats), "Heart of House" or "HOH" (making sure the floor is stocked / stocking the shelves with product from the back), or "Merchantainer" (handing out samples, waving at guests with a Mickey glove or wearing a Goofy hat and greeting). I always had fun at Goofy's. Because there were two different kinds of shifts, it never got boring! I always felt like I was doing something different! Merchandise was my second choice. My first choice was Concierge/ Front desk. Part of me still really wishes I had gotten the experience of working as Concierge. I feel like that would have given me the opportunity to learn so much about the property. And I adore the resorts, so I've always wanted to work at one. However, I am absolutely thrilled with my experience in Merchandise. Looking back on my program I would not change a thing. Goofy's was such an amazing location and I had a blast everyday. Plus, there is so much room for guest interaction in Merchandise, and I'm so appreciative that I was able to take advantage of that! 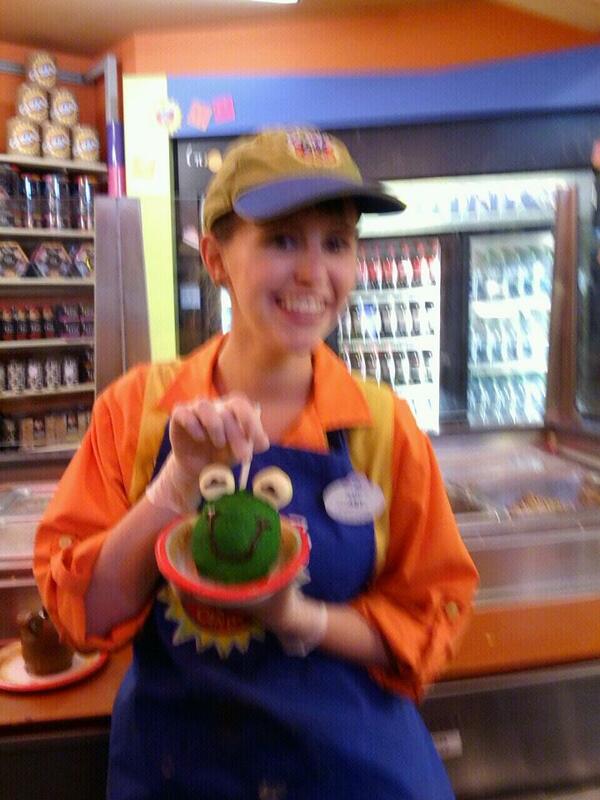 My favorite part about working at Goofy's was learning to make all of the candy treats! When I was in the kitchen I loved having people, especially kids, watch me make the treats through the glass. Making fishy faces at the kids always resulted in special funny moments! My least favorite thing about Goofy's would probably be working on the registers. There were days I had great floor shifts, but then there were the days when ringing up the same items over and over made me a little crazy. But that's just me being nit-picky! I really did love my location and I find it hard to find ANYTHING to complain about at Goofy's. Amy with an adorable candy apple! There are too many to choose from! There was the time I was greeting with the glove and Goofy hat on and a little boy (maybe 3 years old?) pointed and yelled "Goofy!" because apparently the hat was enough to make me look like him! I always loved making cotton candy in the kitchen because we were allowed to give away as many handfuls of fresh cotton candy as we'd like. So there were dozens of times I'd notice a kid or two staring at me drop-jawed through the glass as I whisped fresh cotton candy out of the machine and into the bags. It was always very fulfilling to be able to grab a fresh handful and pass it out of the kitchen to them as a magical moment! On slow days on the floor I would ask princesses for their autograph and give then a sample of our Goofy Glaciers (or icees) in return. One day in the kitchen a young man told us he was planning to ask his girlfriend to prom in a few days and wanted a way to make it magical. I grabbed a cookie and wrote "Prom?" on it in cursive with white chocolate, then coated it in sprinkles so it looked nice and pretty. He LOVED it! He was so appreciative and told us he was planning on giving her the cookie during the fireworks at Magic Kingdom (AWWWWWW!) When you work with candy there is no limit to the kinds of magical moments you can make, and I'm so thankful for that! I first learned about the DCP during the summer before my sophomore year of highschool. My family and I were on vacation. We were riding the boat from the Wilderness Lodge to Magic Kingdom when the captain (Captain Bruce, I remember him to this day) walked up to us and started chit chatting. He & I instantly started talking Disney heritage, swapping stories and sharing trivia. He paused for a moment and said "you just seem like the type of gal who could make all kinds of magic here in Disney. Would you ever want to work for the mouse?" And of course I've ALWAYS wanted to work down in Disney World. It's my favorite place! I told him that, and he proceeded to tell me about the Disney College Program. From that day on it became something that I wanted to do. I dreamt of it all through high school. I arrived at college as a pre-med major, and even though there was no connection with the DCP and my career choice, I was still determined to find a way to make it fit into my four years of undergrad. And I'm so pleased that I made it work! YES. No one warns you how bad your FEET hurt for the first few weeks! From hitting up the parks, to traipsing all over Magic Kingdom during Traditions, to walking all over your work property during orientation, to being on your feet for 6 - 12 hours a day at work... your soles will take a HARD hit at first. Invest in some Dr. Soles insoles IMMEDIATELY. They don't have to be fancy! I purchased some $12 ones and they lasted in my work shoes throughout my entire program! You'll leave Orlando with about a half inch of callus on the bottom of your feet, I swear to you. My dogs have become INVINCIBLE! The good news is that merchandise is an EXCELLENT role to have experience in, especially in Disney World! Retail is a huge sector of employment so if you're looking for a summer job or something part time while you're in school, apply for a retail position and let them know that you worked merch for Disney... boom, I guarantee you they'll hire you on the spot! As far as advice: be prepared to stand. a lot. Behind or in front of a register usually. But there are ways to make the best of that! Merchandise gives you so much potential for guest interaction. Stand in front of your register and greet the pirates and princesses that walk by. Ask where people are from. Cheer when you see a family sporting your hometown's sports gear! (I always clapped for Phillies hats or Flyers shirts that made their way through Goofy's). Take advantage of the fact that you get more face time with guests when you ring them up than an Attractions cast member gets as they group families into rows or a Quick Service cast member gets as they plate orders. That being said, there will also be the busy times. Spring Break was crazy and so are the Holidays from what I've heard. Just remember that for every exhausting, repetitive, long shift you endure, there is another shift that is pure magic! Every role has its ups and downs, Merch is no exception. Just go with the flow and try to remind yourself: you're in the most magical place on earth! And you're MAKING the magic! How lucky are you? Do it. Do it. Do it. DO THE DISNEY COLLEGE PROGRAM! It doesn't matter what kind of career your'e interested in for the future, you can learn something from the DCP no matter what. I learned so much about myself, how to live with other people, how to handle conflict... the lessons go on and on and on. There are so many different roles and so many different experiences that go into and come out of this program that there TRULY IS something for EVERYONE. Not to mention you have unlimited access to the most magical theme parks, shopping destinations, resorts and waterparks the world has to offer. Yes, it's true, you work a lot and you may endure many stressful weeks... but the positives completely outweigh the negatives on this program. And each negative has something to teach you. So go for it! It's a fascinating and eye-catching thing to put on a resume, and it's a life-changing and incredibly fun learning experience that I guarantee you will always cherish! I made it after I got home from my program. It's a big compilation of all the clips and photos I had from my program! It gives a great idea of everything I accomplished and all the amazing memories I'll have from my program... Think of it as my DCP condensed into 20 minutes!!! And if you like that video, feel free to check out my other vlogs here! I made at least 1 or 2 each week of my program! Thanks again everybody! Remember, if you can dream it, you can do it!